In the mid 80s, “garnacha” or Grenache was one of the most popular grapes in Rioja. Thanks to its adaptability, Grenache grapes could resist heavy rains and other diseases with a safe result for table wines. These qualities and the short resistance to oak created a not-so-good reputation for this grape. Little by little tempranillo grapes replaced the vineyards of Grenache and in some areas, Grenache almost disappeared. An almost forgotten grape variety that is recovering is position and prestige, as the autochthonous grape from Spain. It is also known as “tinta aragonesa” or “tinta de Aragon”, because its origin is located in the north east area of Spain, in the regions of Aragon and Catalunya. It is the Mediterranean grape variety more planted in the world. In Spain Grenache vineyards are mainly located in Zaragoza, Toledo, Navarra, La Rioja, Madrid and Tarragona. 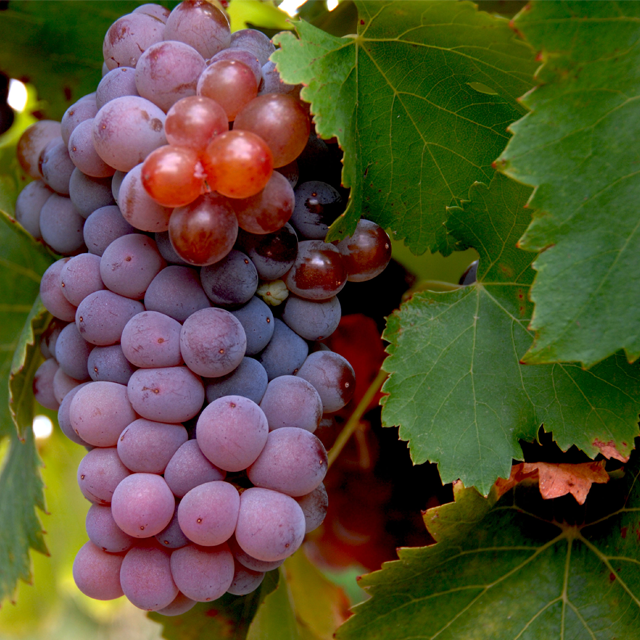 There are different varieties from Grenache: “garnacha peluda”, “white Grenache”, “garnacha tintorera or red Grenache”…. Grenache bunches are medium and compact, dark blue and violet colour resulting in balanced wines, moderate acidity, and high alcohol content. The production is small but much appreciated by the structural complexity in the wines. It is a grape that reflects the character of the soil, so the same grape can have different characteristics and even experts can be confused. Grenache grapes blend and form excellent coupages and also make great rosés due to its fresh fruit content. – Most of the wines have a modern style: lots of fruit, rich flavour, with personality and medium body. – Rosé wines are very rich in aromas, fresh, floral, which remind of red berries. – Grenache grapes are good for young wines and premium oaked wines. – It is considered the “wine of love” because it is warm and silky. It creates a more intimate atmosphere. Nowadays, Grenache is fashionable. There is even the Day of Grenache, the third Friday in September and there is an international wine competition called Grenaches du Monde specialized to promote the quality of these wines. • Castillo de Albai Rosado.